Today was our check out day from the Polynesian. 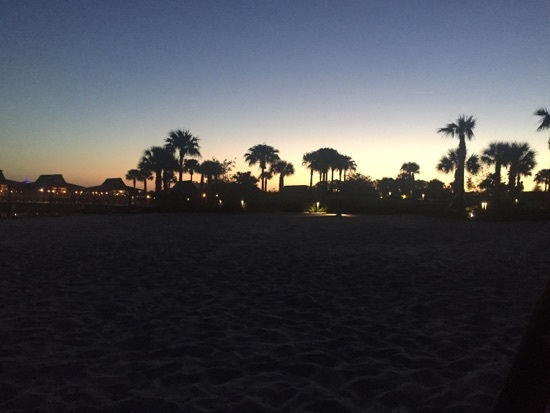 I have completely fallen in love with this resort, what was supposed to be a couple of nights to try it out has turned into us looking to do 14 nights here next year if we can get the reservation at 7 months, or certainly a split stay with bay lake tower. After we got ourselves packed up and checked out we headed to Hollywood studios. We had a lunch reservation at Hollywood and vine for the character meal with the disney junior characters. DD loves Sofia and Doc so this is a must do for us. This places often gets bad reviews but I actually love the food here. The shrimp pasta Alfredo is delicious! 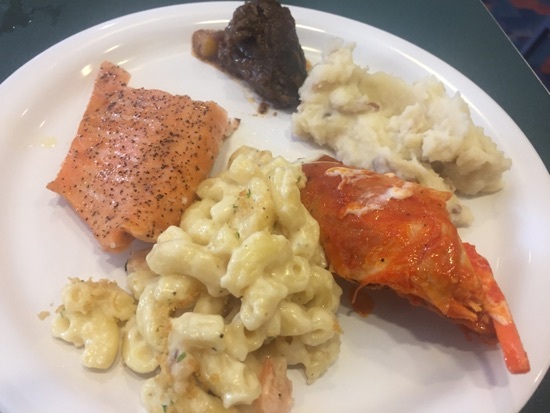 I also had buffalo chicken, garlic mashed potatoes, beef stew, baked salmon. All of theses were very good! 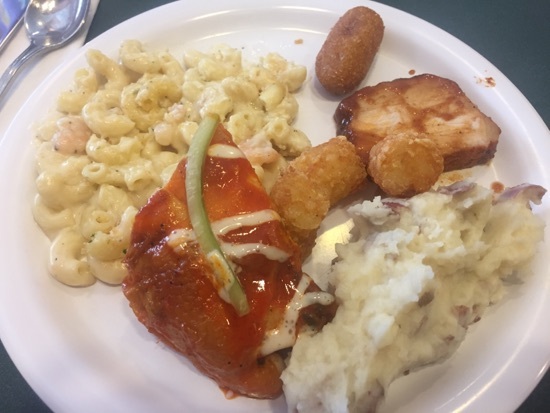 This is a second plate with more buffalo chicken and mash, shrimp pasta Alfredo, some BBQ pork, tater tots and a mini corn dog. 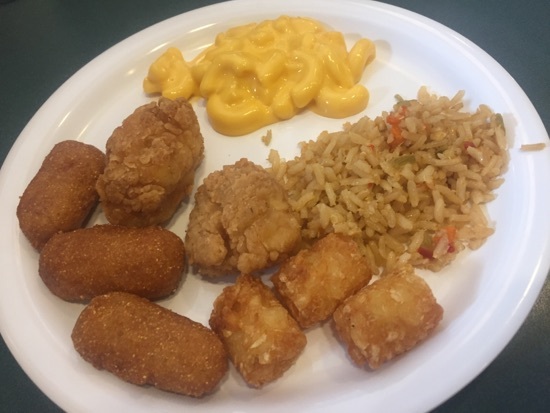 DD had mini corn dogs and tater tots, Mac cheese, chicken nuggets and rice. She really enjoyed this especially the rice. There was a huge salad and fruit selection. These were very fresh. 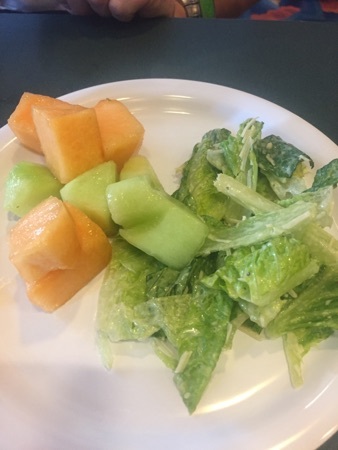 This is a Caesar salad and some melon. They had a selection of mini desserts and a self serve ice cream machine with chocolate, vanilla and twist ice cream. 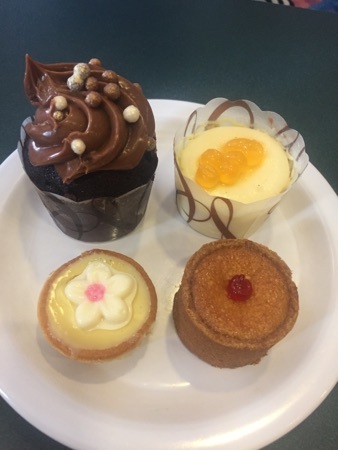 These desserts were a key lime pie, coconut flan, passion fruit cheesecake and a chocolate peanut butter cupcake. The cupcake was definitely the best! So moist and plenty of tasty topping. They also had strawberry cupcakes and a few other selections. We really enjoyed our meal here, it's very expensive at $30 for children and $49 for adults. Glad we were on the dining plan. After lunch we spent the afternoon in Hollywood studios and then made the short walk along the walkway to the beach club for our dinner reservation at cape may cafe. 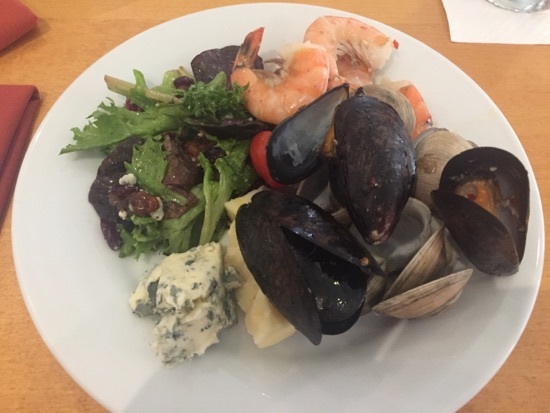 We love cape may cafe, another just do for us! Here is my first plate of Caesar salad, cranberry cheese, blue cheese, fries clam strips, tartare sauce, fried shrimp and crabs legs. This was all really good! 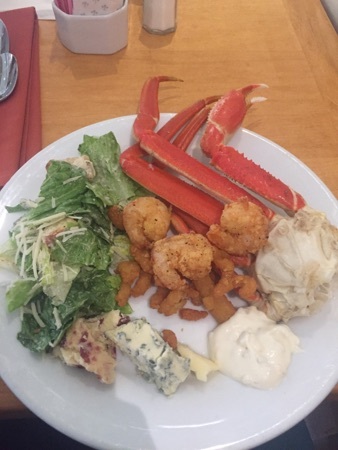 The blue cheese was so creamy and the crab legs were delicious! Here is my second visit with crabs legs, sundried tomato salmon, paella, fried clam strips and cocktail sauce. All really tasty! 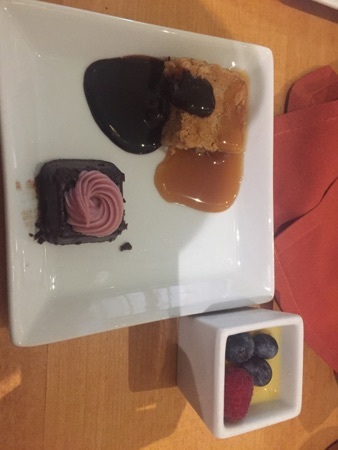 The dessert selection here is probably my favourite desert selection at any buffet I have ever been to! 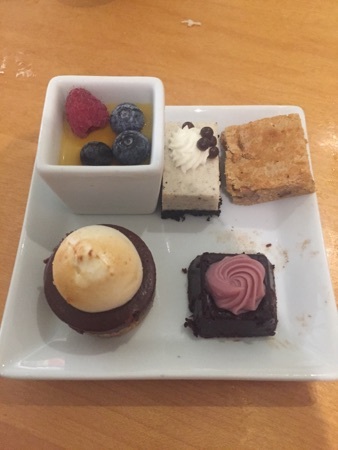 Here we have (top) creme brûlée with berries, Oreo cheesecake, peanut butter blondie, (bottom) smores cheesecake, flourless chocolate cake. I loved everyone of these! Especially the Blondie. On my second visit I got more blondie and added caramel and chocolate sauce! So good! I also got another flourless chocolate cake and creme brûlée. 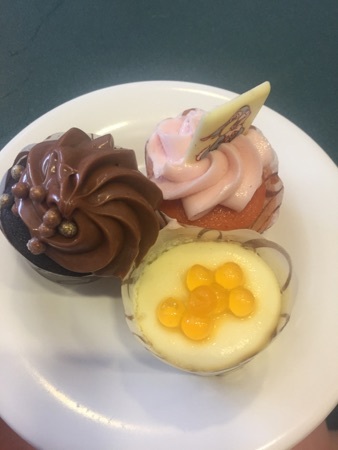 They also had a variety of mini cupcakes to choose from including mocha, lemon and strawberry. This cost $43 per adult and $24 for children. It was absolutely worth every penny! After dinner we headed back to Hollywood studios and DD had an ice cream using a snack credit. This was $6 and massive! 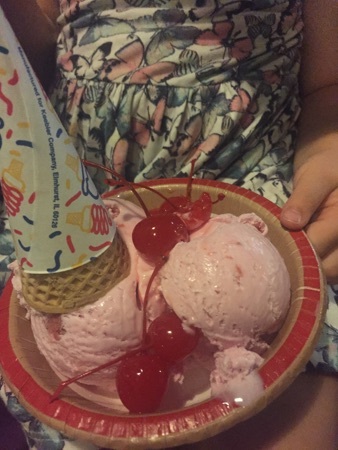 The 2 scoops of ice cream filled the bowl, the ice cream was lovely and had chunks of real strawberry in it. New Photo Added by missdopey - 21 Apr 17 3:31 AM. Cracking looking buffet food at both restaurants. 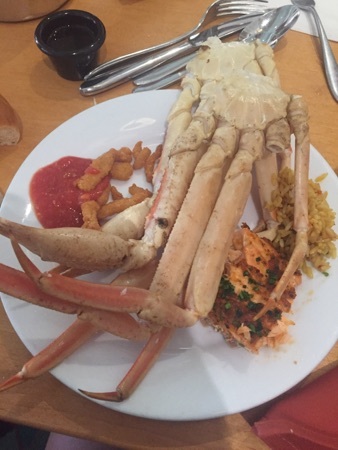 The deserts look like my favourite, although how big are those crab legs! Loving the look of Cape May cafe! We've booked there for May, can't wait! Quality Inn International : 1999, 2007 & 2010.